Luke Miller accepts his prize for the winning essay – a computer from MPA. Through the efforts of the Bloomfield Police Department, Community Safety Net, and Davis County Schools, area fourth graders were recently given the opportunity to learn about a wide array of safety topics as well as receive books for their school library. The discussions, led by Officer Buddy Harsch of the Bloomfield Police Department (BPD), ranged from topics such as “Farm Safety” to “Swimming” and even “School Safety”. After those visits, the students were given two weeks to each write an essay on what being safe means to them. 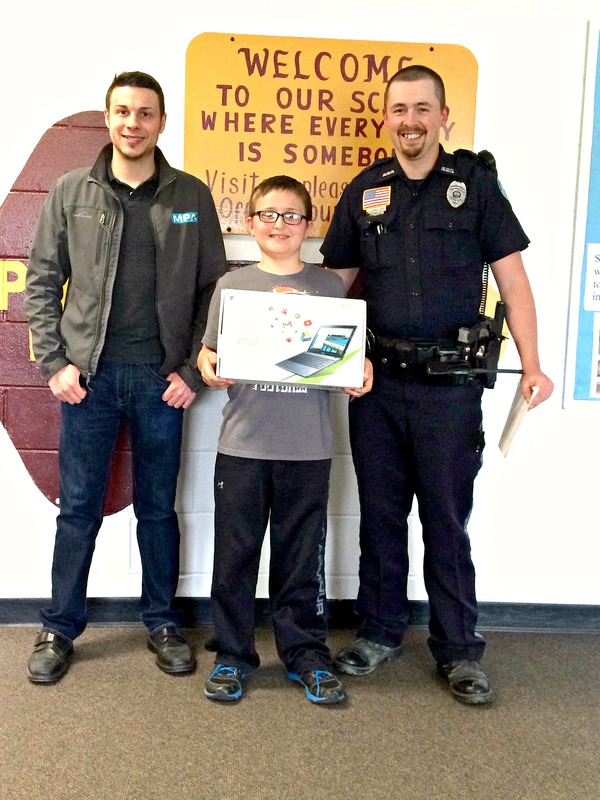 The staff and officers at the BPD read each essay, then selected the winner, who would receive a computer donated by creative technology company MPA. This year’s essay winner was student Luke Miller. You can view his essay below (click on the image for a larger size). Congratulations to Luke, and thank you to all participants involved in bringing this vital learning opportunity to the area students.